Stanford scientists have developed a technique that could make carbon nanotubes an attractive, low-cost alternative. This drawing shows the damaged outer wall of a carbon nanotube with nanosized graphene pieces (white patches), which facilitate the formation of catalytic sites made of iron (yellow) and nitrogen (red) atoms. The catalyst reduces oxygen to water. Platinum catalysts in fuel cells are too expensive for large-scale production. Stanford scientists have developed a technique that could make carbon nanotubes an attractive, low-cost alternative. Fuel cells use chemicals to create electricity. They are used, for example, to keep the lights on for astronauts in orbiting space stations. They hold promise in a variety of areas, such as fuel-cell cars. But the high price of catalysts used inside the cells has provided a roadblock to widespread use. Now, nanoscale research at Stanford University has found a way to reduce the cost. Multi-walled carbon nanotubes riddled with defects and impurities on the outside could eventually replace some of the expensive platinum catalysts used in fuel cells and metal-air batteries, according to Stanford scientists. Their findings are published in the May 27 online edition of the journal Nature Nanotechnology. "Platinum is very expensive and thus impractical for large-scale commercialization," said Hongjie Dai, a professor of chemistry at Stanford and co-author of the study. "Developing a low-cost alternative has been a major research goal for several decades." Over the past five years, the price of platinum has ranged from just below $800 to more than $2,200 an ounce. Among the most promising low-cost alternatives to platinum is the carbon nanotube – a rolled-up sheet of pure carbon, called graphene, that's one atom thick and more than 10,000 times narrower a human hair. Carbon nanotubes and graphene are excellent conductors of electricity and relatively inexpensive to produce. For the study, the Stanford team used multi-walled carbon nanotubes consisting of two or three concentric tubes nested together. The scientists showed that shredding the outer wall, while leaving the inner walls intact, enhances catalytic activity in nanotubes, yet does not interfere with their ability to conduct electricity. 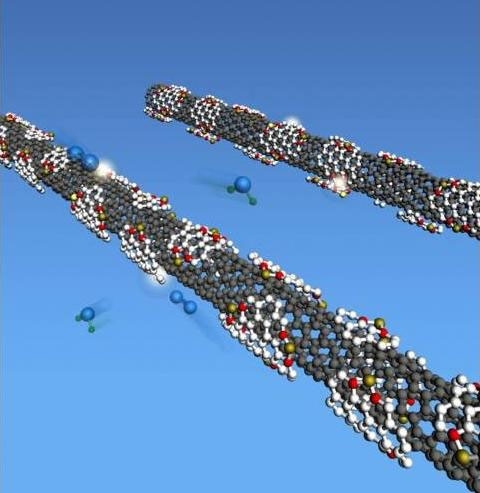 "A typical carbon nanotube has few defects," said Yanguang Li, a postdoctoral fellow at Stanford and lead author of the study. "But defects are actually important to promote the formation of catalytic sites and to render the nanotube very active for catalytic reactions." For the study, Li and his co-workers treated multi-walled nanotubes in a chemical solution. Microscopic analysis revealed that the treatment caused the outer nanotube to partially unzip and form nanosized graphene pieces that clung to the inner nanotube, which remained mostly intact. "We found that adding a few iron and nitrogen impurities made the outer wall very active for catalytic reactions," Dai said. "But the inside maintained its integrity, providing a path for electrons to move around. You want the outside to be very active, but you still want to have good electrical conductivity. If you used a single-wall carbon nanotube you wouldn't have this advantage, because the damage on the wall would degrade the electrical property." In fuel cells and metal-air batteries, platinum catalysts play a crucial role in speeding up the chemical reactions that convert hydrogen and oxygen to water. But the partially unzipped, multi-walled nanotubes might work just as well, Li added. "We found that the catalytic activity of the nanotubes is very close to platinum," he said. "This high activity and the stability of the design make them promising candidates for fuel cells." The researchers recently sent samples of the experimental nanotube catalysts to fuel cell experts for testing. "Our goal is to produce a fuel cell with very high energy density that can last very long," Li said. Multi-walled nanotubes could also have applications in metal-air batteries made of lithium or zinc. "Lithium-air batteries are exciting because of their ultra-high theoretical energy density, which is more than 10 times higher than today's best lithium ion technology," Dai said. "But one of the stumbling blocks to development has been the lack of a high-performance, low-cost catalyst. Carbon nanotubes could be an excellent alternative to the platinum, palladium and other precious-metal catalysts now in use." The Stanford study might also have resolved a long-standing scientific controversy about the chemical structure of catalytic active sites where oxygen reactions occur. "One group of scientists believes that iron impurities are bonded to nitrogen at the active site," Li said. "Another group believes that iron contributes virtually nothing, except to promote active sites made entirely of nitrogen." To address the controversy, the Stanford team enlisted scientists at Oak Ridge National Laboratory to conduct atomic-scale imaging and spectroscopy analysis of the nanotubes. The results showed clear, visual evidence of iron and nitrogen atoms in close proximity. "For the first time, we were able to image individual atoms on this kind of catalyst," Dai said. "All of the images showed iron and nitrogen close together, suggesting that the two elements are bonded. This kind of imaging is possible, because the graphene pieces are just one atom thick." Dai noted that the iron impurities, which enhanced catalytic activity, actually came from metal seeds that were used to make the nanotubes and were not intentionally added by the scientists. The discovery of these accidental yet invaluable bits of iron offered the researchers an important lesson. "We learned that metal impurities in nanotubes must not be ignored," Dai said. Other co-authors of the study are Hailiang Wang, Liming Xie and Yongye Liang of Stanford; Wu Zhou, Juan-Carlos Idrobo and Stephen J. Pennycook of Vanderbilt University and Oak Ridge National Laboratory; and Fei Wei of Tsinghua University. This work was supported, in part, by a grant from the Precourt Institute for Energy at Stanford, Intel, Lawrence Berkeley and Oak Ridge national laboratories, the Department of Energy and the National Science Foundation. Mark Shwartz writes about energy technology for the Precourt Institute for Energy at Stanford University.